"Eastern China temperatures varied with the solar activity, showing higher temperatures under stronger solar irradiation, which produced stronger summer monsoons. During Maunder, Dalton and 1900 sunspot minima, more severe drought events occurred, indicating a weakening of the summer monsoon when solar activity decreased on decadal timescales. Hence, our record illustrates the linkage of Asian summer monsoon precipitation to solar irradiation and ENSO: wetter conditions in the study area under stronger summer monsoon during warm periods, and vice versa. " ENSO [El Nino Southern Oscillation] itself has also been linked to solar activity and possible lunar tide effects. 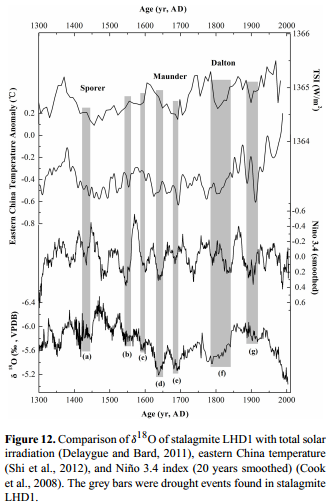 The paper joins many others describing potential solar amplification mechanisms by which tiny changes in solar activity may have large effects upon climate including temperature, atmospheric and ocean oscillations, and the hydrological cycle. We present a highly precise, 230Th / U-dated, 1.5-year resolution δ18O record of an aragonite stalagmite (LHD1) collected from Lianhua Cave in the Wuling Mountain area of central China. The comparison of the δ18O record with the local instrumental record and historical documents indicates that (1) the stalagmite δ18O record reveals variations in the summer monsoon intensity and dry–wet conditions in the Wuling Mountain area. (2) A stronger East Asian summer monsoon (EASM) enhances the tropical monsoon trough controlled by ITCZ (Intertropical Convergence Zone), which produces higher spring quarter rainfall and isotopically light monsoonal moisture in the central China. (3) The summer quarter/spring quarter rainfall ratio in central China can be a potential indicator of the EASM strength: a lower ratio corresponds to stronger EASM and higher spring rainfall. The ratio changed from <1 to="">1 after 1950, reflecting that the summer quarter rainfall of the study area became dominant under stronger influence of the Northwestern Pacific High. Eastern China temperatures varied with the solar activity, showing higher temperatures under stronger solar irradiation, which produced stronger summer monsoons. During Maunder, Dalton and 1900 sunspot minima, more severe drought events occurred, indicating a weakening of the summer monsoon when solar activity decreased on decadal timescales. On an interannual timescale, dry conditions in the study area prevailed under El Niño conditions, which is also supported by the spectrum analysis. Hence, our record illustrates the linkage of Asian summer monsoon precipitation to solar irradiation and ENSO: wetter conditions in the study area under stronger summer monsoon during warm periods, and vice versa. During cold periods, the Walker Circulation will shift toward the central Pacific under El Niño conditions, resulting in a further weakening of Asian summer monsoons.